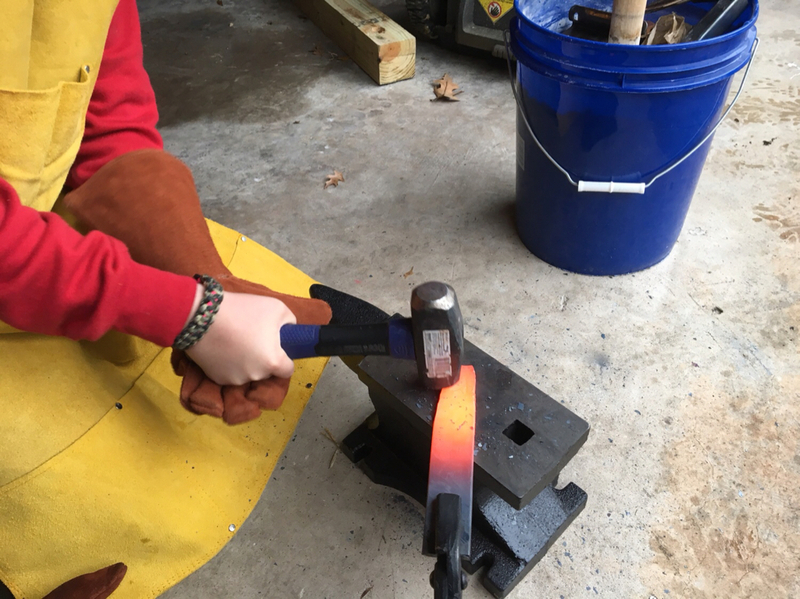 My son attempted to make a knife with out crawfish burner and a piece of rebar over the summer, but it just barely heated the metal enough to work with. 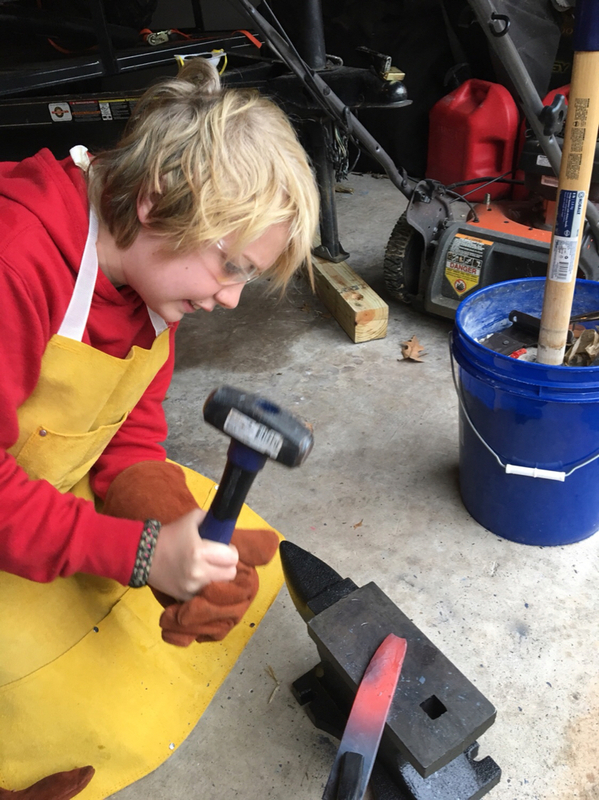 We got him a small forge for Christmas, and my in laws got him tongs and an anvil. Even with the nasty weather today he played with fire and metal and began on a knife. I must say the little forge works pretty good. It heated the steel to a bright orange glow pretty quickly and reheated it in just a minute or two. We need to mount his anvil on something so he can put his back into his hammer swings, but he made do with it for today. I never did anything like this when I was 11 so I’m having just as much fun watching as he is hammering. Very cool. Get that kawool covered up though. It's some nasty stuff to breath in. Awesome! Love to see kids working with their hands. WOW! That is awesome!! That young man is doin' it right! Good on you dad for helping and supporting him! Sure beats sitting on the couch playin' video games! That is so cool! Very nice. Can’t wait to see the final product. That's 1 of the coolest things I've seen in a long time. Doesn’t matter how that knife turns out...cuz no matter what, it will be AWESOME. Cool!! Much better than inside playing on a phone or video game!! Thanks! He and I were laughing while doing it that he had a gift card to Game Stop but instead of going to get a video game he wanted to go to Triple S Steel and pick out material. I gotta say again that I would have never even thought of all this when I was 11, much less been allowed to try it. So at 43 I am having just as much fun learning as he is, only I get to help guide him for opportunities later in life. Definitely way cool. Don’t you mean “Eet weel cut”? Where do you buy a forge like that? 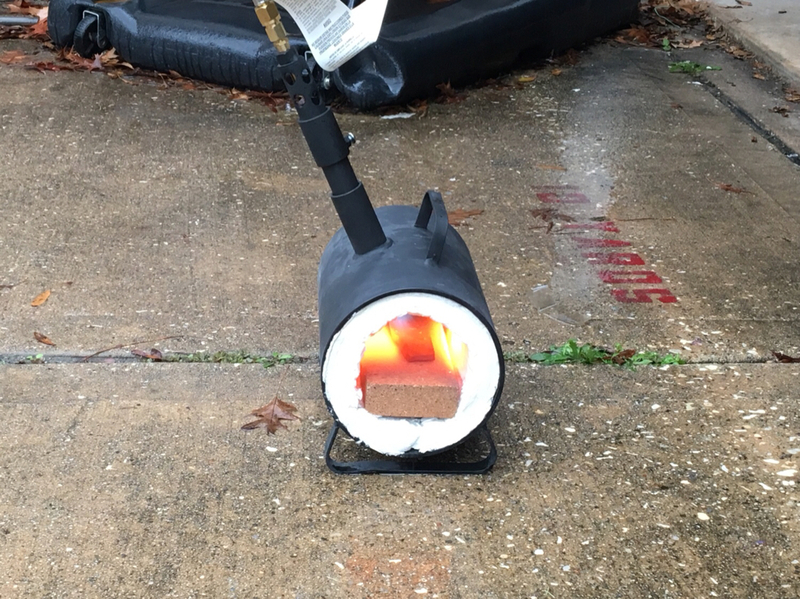 Very cool, my son got into it this year as well and looks like we got him the same forge. Picked up a box of railroad spikes and he has been hammering away, his first knife was pretty crude but actually turned out very sharp and he used it to cut up steak that night. Have since picked up a cheap anvil and it has made a huge difference over hammering on a piece of plate. Very cool wish I started making knives at 11!! eBay had several different propane forges. That’s where we got it. Laredo Blacksmithing or something like that. I think it was $160 or $170. Small but well made. Want me to ask my tree guy neighbor for a chunk of oak trunk to mount the anvil to? Chain it to the trunk and you are good to go! A good buddy of mine did this for his anvil but added some heavy duty locking casters so he and his son can wheel it around. He also used some heavy duty lag bolts to secure it to the stump. Nail some leather strips around it to hold hammers and other forging tools. Good to see these young men wanting to learn the old skills. Ol dad may learn something's also. That looks like a ton of fun. Good job, Dad. Heck yeah buddy thats awesome! Soon y'all will be building knives and welding up deer lease stuff!